Lucknow, Varanasi, Khajuraho, Orchha, Gwalior and Delhi. Upon arrival in Lucknow, our representative will meet you transfer you to hotel. 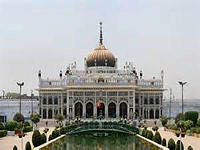 Lucknow is the capital city of the state of Uttar Pradesh in India and one of the most famous metropolitan cities of India. It has always been known as a multicultural city and it flourished as a cultural and artistic hub of North India in the 18th and 19th centuries as a seat of power of the Nawabs. Asafi Masjid: the tomb of a Shi'ite Muslim holy man, built in 1784 by Asafud- Daula as a famine relief project. Hussainabad Imambara: a major attraction of Lucknow. The monument was built by Mohammed Ali Shah in the year 1837. Picture Gallery: also known as the "Baradari" - literally meaning hall having 12 doorways. It is now used as the office of the Husainabad Trust and the main hall is a picture gallery housing life-size portraits of ten Nawabs of Avadh. Clock Tower: between the Bara Imambara and Chhota Imambara is the Clock Tower of Lucknow,dating from 1880 and the tallest Clock Tower in India. La Martiniere College: La Martiniere Schools were founded posthumously by Major General Martin in the early 1800s. Martin had acquired a large fortune while serving the Nawab of Awadh Asaf-ud-Daula and bequeathed a major part of his estate to establish the schools. 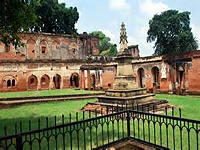 Residency: The British Residency of Lucknow is a famous historical landmark, but is now in ruins and has been declared a protected monument by the Archaeological Survey of India. Dilkusha Palace: The ruins of lofty buildings built in 'Gothic Style' casting their long shadows on the natural carpet of lush green grass and beds of flowers, it the palace was built by Sadat Ali Khan is a romantic setting for the lovers of the city. 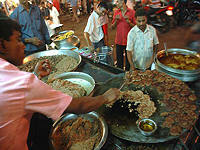 This evening we take a culinary walk to discover the local Awadhi Cuisine. Lucknowites spend much their time and money on their kitchens. There is a full street where one can find the best from Lucknow's very own kitchens.You can pop inand out of the traditional roadside eateries, trying the best on the menu. (We provide cutlery and basic dining equipment allowing you to experience the foods without having to worry about how to eat without a fork or to wipe your hands clean after you are done.) Overnight in Lucknow. After breakfast transfer to Lucknow Railways Station and board train to Varanasi. Meet upon arrival and transfer to hotel. 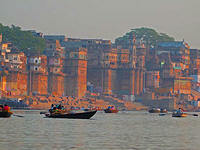 Varanasi, known to the devout as Kashi, is said to have been founded by Shiva, Lord of the Universe. One of the oldest living cities in the world, as also one of the most important pilgrimage sites in India, Varanasi is situated on the banks of the sacred Ganges and has been a center of learning and civilization for over 2000 years. Overnight at Varanasi. Today take a city tour of Varanasi including a visit to Bharat Mata Mandir (Mother India Temple), Durga Temple (popularly known as monkey temple) and Benares Hindu University. After lunch, take an excursion to Sarnath, previously known as Mrigadava, "deer park," and Isipatana, meaning the place where holy men (Pali: isi) fell to earth. In the evening. 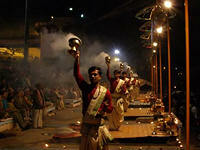 witness Aarti ceremony at the Dashaswamedh Ghat on the holy river Ganges, which takes place after the sunset for around 45 minutes. Overnight at Varanasi. Early in the morning drive to Daswamedh Ghat and take a boat ride on the sacred river Ganges to see the cremation Ghats and witness the living traditions of one of the world's oldest and most important religions. Board a boat with your guide and proceed to the middle of the river, where at sunrise the sight unfolds before you. As you step out on the streets again, you will witness the unfurling of the bazaars around you & pass thru Kashi Vishwanath Temple while returning to the hotel to freshen up and breakfast. Later proceed for special walking tour through the mystical landscape of poets, sacred temples, holy ponds near Assi ghat, the southernmost embankment of the holy Ganges river. In the evening proceed to the traditional music school run by a family who will demonstrate and describe their traditional instruments. Overnight at Varanasi. After breakfast transfer to Varanasi airport to board flight to Khajuraho. Upon arrival, our representative will meet and transfer you to the hotel. Located in the Bundelkhand region of Madhya Pradesh, Khajuraho has emerged as a renowned destination from a tiny unknown village. A World UNESCO Heritage Site it is famed for magnificent temples and intricate sculptures, Of the 85 beautiful temples, only 22 have survived the ravages of time. Made of sandstone blocks fitted together, these remain as a collective glorification to life, love and joy, to the spirit of creativity and human relationships. Built by the Chandela rulers in 9th and 10th century AD, the temples exhibitcarved images of gods and goddesses, celestial maidens and dancers, animals and musicians, all frozen in stone. Overnight at Khajuraho. After breakfast drive to Orchha (170 kms/03 ½ - 4 hrs). On arrival check in at hotel. Orchha's grandeur has been captured in stone, frozen in time, a rich legacy to the ages. In this medieval city, the hand of time has rested lightly and the palaces and temples built by its Bundela rulers in the 16th and 17th centuries retain much of their pristine perfection. Complementing the noble proportions of their exteriors are interiors which represent the finest flowering of the Bundela school of painting. In the Laxminarayan Temple and Raj Mahal, vibrant murals encompassing a variety of religious and secular themes, bring the walls and ceilings to rich life. Afterwards visit to Orchha Fort, Jehangir Mahal, Raj Mahal, Memorial of Maharaj on banks of Betwa river. Evening witness Aarti ceremony at Ramraja Mandir. Overnight at Orchha. After breakfast drive to Gwalior enroute visit Jhansi Fort (120 kms 2-3 hrs). Jhansi Fort or Jhansi ka Kila is a fortress situated on a large hilltop called Bangira, in Uttar Pradesh, Northern India. It served as a stronghold of the Chandela Kingsin Balwant Nagar from the 11th through the 17th century. Continue the drive to Gwalior. Upon arrival check in to the hotel.Overnight at Gwalior. Breakfast at the hotel. 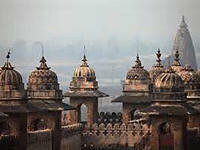 Visit Gwalior Fort, Man Mandir Palace, Gujari Mahal and Archaeological Museum. Gwalior Fort is an 8th-century hill fort near Gwalior. The fort consists of a defensive structure and two main palaces, Gurjari Mahal and Man Mandir, built by Man Singh Tomar. The fort has been controlled by a number of different rulers over time. The Gurjari Mahal palace was built for Queen Mrignayani. It is now an archaeological museum. Later we transfer to Gwalior railway station to board train to Delhi. On arrival at railway station our representative will meet you and transfer to hotel. Overnight in Delhi. This morning after breakfast, we take a full day combined city tour of the old and modern capitals of India. Visit Jama Masjid, the largest mosque in India. 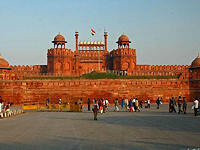 Visit the massive Red Fort, Chandni Chowk and Raj Ghat - the cremation site of Mahatma Gandhi. Visit the Qutub Minar - a 72 meter high monument, and Humayun's Tomb built in mid 16th century. Also visit the Lotus Temple. Drive past India Gate, the Presidents House, Safdarjung's Tomb and the Parliament. Overnight in Delhi. Transfer to airport for your return flight to UK. 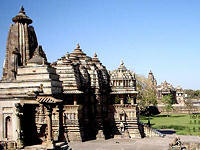 See the palaces and temples of ancient and more modern India.